This extraordinary vintage pen is a 1917 Waterman Model (05)42 “Continental Safety” eyedropper-fill in black hard rubber with the famous “Pompeiano” overlay depicting images of 3 different semi-clad Greek Goddesses in Archways. Intricate Floral & Vine cap, cap top and clip design. Looks like “bas relief,” but is really complex guilloche engraving. Cap indicia engraved, “CV.” Double-broad nib. 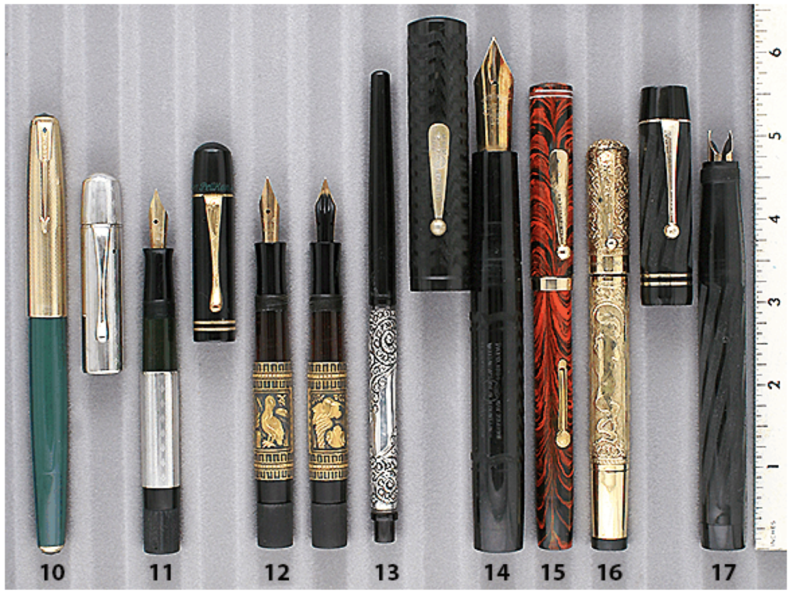 The pen is featured in the Waterman Safety book (the book may be equally rare!). Signs of ink in the barrel and cap, otherwise near mint+. Unrestored. Item #16 in Catalog #85.